Scrunchies are very trendy at the moment! We have nice scrunchies in our jewelry webshop in various beautiful colors. With a pink outfit you can wear a white, pink or black scrunchie. You can combine your new scrunchie easly with other hairaccessoiries. You’ve probably seen these cute hair bows go by on instagram, facebook and on youtube. Many celebrities and fashionistas already wear them. For example, do you have a bad hair day, don´t you want to wear your hair loose ? then the scrunchie is the solution. You can wear your new scrunchie in different ways. You can do it around your bun or tail. The scrunchie ensures that your outfit gets color. 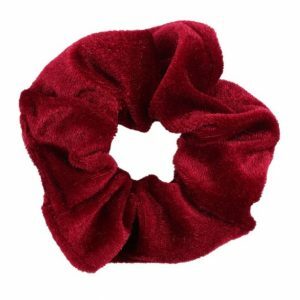 For example, you can wear a red scrunchie with an all black outfit. That way it will stand out extra. This way you look nice and have a super trendy haircut! We have scrunchies in the colors red, blue, pink, white and black. But also with the popular animal print. The scrunchies are made of nice and soft fabric. 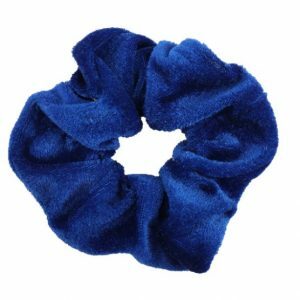 With the scrunchie with your outfit or choose a completely different color. 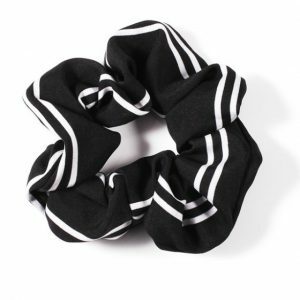 The black scrunchie in particular should not be missing in your wardrobe. 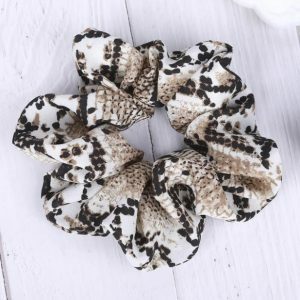 You should also have the popular leopard print scrunchie. 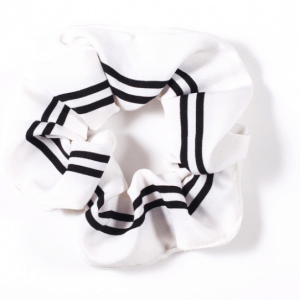 We also have other beautiful prints in our collection, such as the scrunchie with black / white stripes print. Sign up for our newsletter and follow us on social media. This way you will always be informed of the latest jewelry and hair accessories. You can of course wear your scrunchie alone, but it is also nice to wear with other fashion accessories. For example with a trendy hair band. But you can also combine it with stylish jewelry. Our double necklaces are very popular. They are available in the colors silver and gold. You can also make your own layered necklace with minimalist necklace. 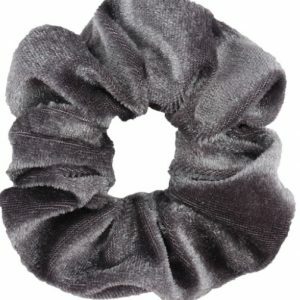 Or wear your scrunchie in combination with a beautiful black velvet choker. You also attract attention to your face with beautiful earrings. When you wear your hair in a tail or bun with a scrunchie, you can wear long earrings. These are available in the colors silver and gold. The hoops earrings also come into their own when your hair is tied. Would you rather wear small earrings to your school or work? then the minimalist studs earrings are perfect for you. Your new scrunchie will also look great with other beautiful jewelry. For example with a minimalist bracelet with a nice pendant. Very popular are the fine bracelets with compass, heart and star pendant. Do you prefer your hands to stand out? then make your own ring party with the minimalist rings from Aphrodite. Do you prefer large, eye-catching jewelry? then combine your scrunchie with statement jewelry. For example with large earrings or with a beautiful statement necklace. In the summer you could combine your new scrunchie with a nice anklet. We have anklets made from alloy and rope in our collection. In the summer, especially the ankle bracelets with shells are very popular. Sign up for our newsletter! this way you stay up to date with the latest trends and items in our jewelry webshop.